I have been on such a mini-book kick recently I almost feared making layouts was going to be hard to get back to but this one actually came together fairly easily – the ideas, anyway, although the execution took a bit of time. I got a few TH masks from the UKS Marketplace and used them for the first time, along with some Cosmic Shimmer mist. 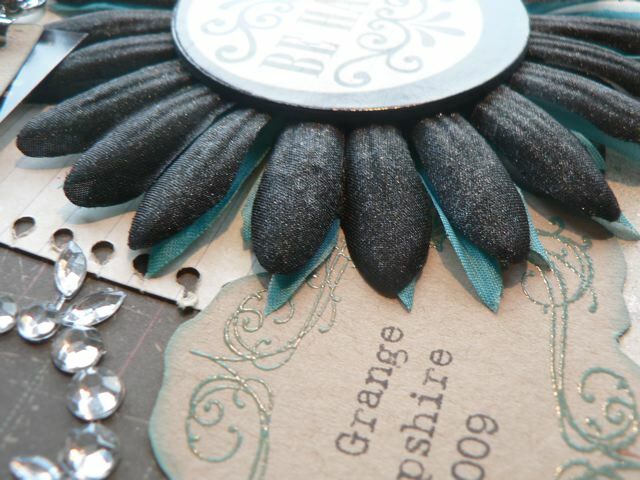 LOVE the silver over the black flower and the photo totally does NOT do it justice. Not too sure about the clip (that holds the two little tickets to the side of the right photo) as it is a bit more dimensional than I would like. I often pry out the spring and stick just 1/2 to a layout so it is flatter but gives the effect of a clip. I may still do that. I am happy with the journaling frames, using the little tip from a couple of days ago. To me they look more professional than if I had cut them freehand with no guidance. I will def. do that again for clear stamps! For the one flower I punched a circle of patterned paper (from behind the photo) and misted it then scrunched it up and added it to the center of another Kaiser Craft paper bloom over a fabric flower. A lot less work than the misted and scrunched may layered flowers but I think it adds a little something so will keep that in mind for later as well. Categories: Layouts, stamping | Tags: Layouts | Permalink. Beautiful. I really like the colour scheme of this page and all the different elements … fabulous work. Shall I let you into a little secret … scrapbook pages terrify me!